Posted on Mon, Jan 23, 2012 : 7:30 a.m. The debate over expanding public transit services in Washtenaw County is expected to take center stage tonight inside Ann Arbor's city hall. The Ann Arbor City Council is being asked to give its initial blessing to the idea of creating a new countywide transit authority, and a mix of opinions abound. A handful of council members remain skeptical about the plan, and Council Member Mike Anglin, D-5th Ward, is actively recruiting residents to come voice opposition tonight. "Jane Lumm, Steve Kunselman and I do not support this transfer of city taxes to a countywide transit authority," he wrote in a recent email to residents. "But we are a minority on council," Anglin continued. "We need you, the citizens of Ann Arbor, to express your opinions to influence the mayor and others on council." Supporters of the transit proposal are rallying their bases, too. Ann Arbor Transportation Authority officials have released a series of documents attempting to clear up misconceptions about the countywide expansion and what's being asked of council tonight. What services are being proposed for the first five years? The City Council is being asked to enter into a four-party agreement with the AATA, Washtenaw County and the city of Ypsilanti. The agreement lays the framework for creation of a new countywide transit authority, but it's only the first step in the process. The council still could decide to opt out later, and residents will have a chance to vote on a funding proposal before any countywide transit authority becomes operational. If Ann Arbor voters fail to approve funding for a new countywide authority — even if a majority of county voters favor it — then the city maintains the right to withdraw from the agreement without penalty, veto any attempt at termination of the current transit operation agreement with the AATA and refuse to transfer the city's transit millage to the new authority. Council Member Sabra Briere, D-1st Ward, has released a briefing paper on the AATA expansion proposal. Tonight's meeting starts at 7 p.m. on the second floor of city hall, 301 E. Huron St. A public hearing on the four-party agreement will be held before the council votes. Briere, who is expecting the agreement to be postponed again, said there are a number of possible amendments that could come up tonight. 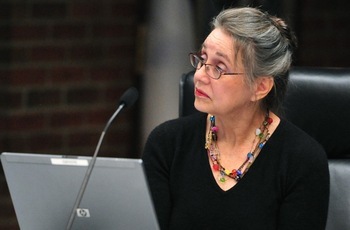 "While the resolution — if amended as I anticipate it will be — only requires that the residents of Ann Arbor (and the residents of the transit district, as a whole) must vote to approve the funding source, a new transit authority cannot be established and begin operating unless the funding source is approved," she wrote to residents. "That won't result in any change for Ann Arbor unless a majority of Ann Arbor voters approve the funding source." But others see the issue differently. In a Jan. 15 email to residents, Anglin criticized Mayor John Hieftje and said he thinks transit services in the core areas of Ann Arbor and Ypsilanti would be reduced by going to a countywide authority. "At the last council meeting, Mayor Hieftje presented a proposal that could have a detrimental effect on the bus service in Ann Arbor," Anglin wrote in the email. "The proposal calls for Ann Arbor to sign an agreement to join in the creation of a county transit authority." Anglin goes on to argue the four-party agreement would require that Ann Arbor turn over its 2-mill transit levy to the new countywide authority. "We are essentially giving up control of our taxes to fund a countywide transit system," he wrote. The transfer of the AATA's assets to a new countywide authority wouldn't be automatic, though. Under terms of the four-party agreement, it would require voter approval before Dec. 31, 2014, of a new funding source adequate to fund ongoing operations. AATA officials argue both Ann Arbor and Ypsilanti would maintain their current services under the new countywide system and see additional benefits from service improvements. Ann Arbor would have seven of the 15 seats on the countywide transit authority board, as currently proposed. Some would like to see that bumped up to eight. The AATA has set up an interim countywide board and a financial task force, which is expected to release its funding recommendations on Friday. One funding option under consideration is a new countywide transit millage layered on top of the taxes Ann Arbor and Ypsilanti residents already pay. It's expected one or more council members will push for postponing approval of the four-party agreement tonight so they can review the funding plan before taking action. Tue, Jan 24, 2012 : 7:26 p.m.
NO THANKS! This is not a fair deal by any means. The cost of this should be placed on the townships that are being serviced. This is making their problem our problem, and it's not my problem. Thanks! Tue, Jan 24, 2012 : 10:40 a.m.
Tue, Jan 24, 2012 : 12:14 a.m. This whole plan just smells like a mess. AA should just concentrate on making improvements to our system with our own money. We ..AA do not need to take the lead on everything. Let the county make a plan and propose a millage and see if all of the county citizens really want the country wide system and the Authority. I sent an email to my Ward 1 council members to vote no and stop wasting our time. Mon, Jan 23, 2012 : 9:19 p.m. I recommend everyone read this column: <a href="http://localannarbor.wordpress.com/2012/01/02/aata-moving-us-where-the-politics-ii/" rel='nofollow'>http://localannarbor.wordpress.com/2012/01/02/aata-moving-us-where-the-politics-ii/</a> The implication seems to be that the countywide authority would not subject itself to a millage vote, but would scoot in under Gov. Snyder's motor vehicle registration changes (which will be voted on, thus fulfilling the letter of the transit agreement). We should insist on an up/down vote before city assets and millage are turned over to an organization outside city control. Mon, Jan 23, 2012 : 7:16 p.m. I encourage anyone who can possibly make it to go to the meeting and voice opposition. I think that's what's needed now for things like the expansion and Fuller station, because without a very clear vocal oppostition, they pretty much just do whatever they like. They already spent more than a million on Fuller Station. Unfortunately, I believe you have to wait until the end of the session, which is when anyone can speak, because I have never been able to reserve time to speak BEFORE the meeting; it's always filled up when I call, and several times I've called as soon as they say you can. I don't know how that Partridge guy always gets on there. But please, tell your freinds, eductae them on what's happening, how their money is being spent, and start going to council meetings to speak up on it. I have, and hope to more often (although I can't make it tonight, unfortunately). With this council, I think that is what's needed to make them start doing the right thing. They need to start seeing and hearing the people who are tired of having their money wasted. Actually, it is a public hearing. I am very grateful to the mayor and council for holding a public hearing because it was not required. By the rules of a public heariing, anyone can speak without signing up, and as many as wish to speak. It is the second public hearing, after 2 presentations, public comment, and communications, so it would probably be safe to plan to arrive by 7:30 to participate. Mon, Jan 23, 2012 : 6:25 p.m.
Mon, Jan 23, 2012 : 5:54 p.m. I have an additional concern beyond the ceding of control to a larger entity: why is AA subsidizing the very forces that drain residents and lower revenues at its businesses? Don't we want people to live *inside* Ann Arbor and go to restaurants and stores here? Why are AA taxpayers being asked to pay more to make it easier for employees of AA businesses to live outside AA? If this is paired with a city income tax, okay, fine. But otherwise, this move seems to shift more and more tax burden to AA residents and away from employees who commute in. Mon, Jan 23, 2012 : 5:46 p.m. I am beginning to question the level of advocacy AATA's CEO and staff are applying to this process. In particular, that &quot;Myths and Facts&quot; document makes statements not supported by the facts. (The title is ironic.) &quot;MYTH: Ann Arbor will not be able to unilaterally withdraw from the Public Transportation Agreement. FACT: Ann Arbor is NOT obligated to join or participate in the transit authority. The Public Transportation Agreement merely provides a transparent framework for discussions to continue and sets clear goals that must be met before a new transit authority can be created. Nothing else.&quot; But if you read it, you will see that it is a contractual commitment. Once signed by all parties, it imposes certain requirements and actions on the signatories. It sets the stage for the county to pass Articles of Incorporation for the Act 196 authority and they call for the County to file them immediately. Once they are filed, the authority is established and has many powers. It will have a board that can enter into agreements, accept grants, apply for loans, and levy any legal taxes. The one out for Ann Arbor at that point is that each unit of government in the county has 30 days to &quot;opt out&quot;. That appears to be the ONLY opportunity for Ann Arbor to withdraw. The current agreement has an amendment that transfer of assets (AATA's hard capital assets, financial assets, and the Ann Arbor millage) cannot take place until Ann Arbor voters vote for a &quot;countywide&quot; public funding measure. But if a millage does pass countywide, Ann Arbor's taxpayers would still have to pay the additional millage (I have this from an attorney). I regret that AATA has taken its advocacy to this level. We may disagree on the policy decisions (should Ann Arbor pay for transit to other communities? Or not?) and we may not see the future in the same way, but we should not be misrepresenting the effect of documents executed in plain language. Mon, Jan 23, 2012 : 5:43 p.m. In case anyone isn't aware, Rich Robben's last meeting on the AATA board was last week. I asked the mayor what his plans are to fill the spot and if applications being accepted now. His response was this: &quot;We always welcome applications and they are always accepted. We have some on file that are being reviewed along with one or two that came in recently.&quot; So, for anyone who feels they could do a good job governing local public transit, here's your chance to apply for that job. Tue, Jan 24, 2012 : 12:32 a.m. I thought Eli Cooper was Sue's replacement. Mon, Jan 23, 2012 : 6:19 p.m.
Ryan, isn't that now two if Sue McCormick gone? Or, I might be uninformed, the mayor has replaced her. Rich is director of Plant Operations at the UM, had his term expired? Or, just got tired of the politics? The majority of the comments seem to be concerns over Ann Arbor getting the short end of the stick. I am concerned with every entity but Ann Arbor getting the short end of the stick. If this somehow gets adopted by the County in some way it must be written that tax dollars for this entity can only be spent in the city, township, etc. in which they were raised. My fear is that the AATA proposal is designed to fleece everyone else. AATA and the Ann Arbor City Council are not trushworthy. Didn't we learn our lesson about ceding local control to county-wide control with education funding? Remember when AA voters voted in favor of &quot;It takes a millage&quot; but the millage didn't pass because the rest of the county voted against it? And now the AA schools are having to cut sports, school bus, teachers, etc. Let's learn from that. The values of AA residents are fundamentally different from those in other counties. Let's control our own destiny. Mon, Jan 23, 2012 : 4:12 p.m. If those in the outlying counties would like to see this implemented, fork up the money. The residents of Ann Arbor should not have to support a majority of the cost for these other areas. Regardless of how some in the city of Ann Arbor would like to keep their green-agenda going. Having the ability to take a bus to the airport isn't high on my list of must haves either. Mon, Jan 23, 2012 : 7:55 p.m. This arrangement allows for the196 Board to make a funding request to voters once per calendar year through the end of 2014. If there is no countywide funding established by that time, this agreement will expire and TheRide would continue to operate its existing services. Mon, Jan 23, 2012 : 3:59 p.m.
Mon, Jan 23, 2012 : 3:36 p.m.
Mon, Jan 23, 2012 : 2:44 p.m.
What a waste of time! This will never happen unless the City of Ann Arbor &quot;Elites&quot; want to pay the entire bill. Mon, Jan 23, 2012 : 2:40 p.m.
First off we are in effect gifting a city asset (buildings, buses, etc.) to the county . Secondly, we are going to be asked to pay more taxes to do so? Remember this is the same county that kicked us out of their court building not too long ago and now we are footing the bill for the Justice Center construction costs/bonds. While we are at it, there are townships without a police force, applying this same logic, let's ask city taxpayers to pay another county wide tax so those townships can have access to all the resources of the AAPD. Also, we should not forget about all those poor out of town commuters who can not find front door parking at the hospital. So why not gift all those people prime parkland on Fuller road and borrow $10 million plus to help finance their new parking structure. Mon, Jan 23, 2012 : 2:39 p.m. The proposed countywide service would increase service everywhere. Ann Arbor would get improved service (and pay for it), as would the other communities in the area. The AATA provides good service in Ann Arbor, but it needs to get better. If you doubt this, just try taking the bus home after the City Council meeting tonight or to Meijer on Sunday; evening and weekend service is inadequate. Enhanced county-wide transit is better for everyone. Mon, Jan 23, 2012 : 2:35 p.m.
you want bus service in your community? pay for it yourself. Exactly, which is why they are doing this. Read the information, ... &quot;This arrangement allows for the196 Board to make a funding request to voters once per calendar year through the end of 2014. If there is no countywide funding established by that time, this agreement will expire and TheRide would continue to operate its existing services.&quot; So, if Manchester wants to get services, they pay just like Ypsi is now, and then they can get services. Otherwise, it's the same service you get now, just with a forum to support growth. Mon, Jan 23, 2012 : 2:12 p.m.
&quot;Ann Arbor would have seven of the 15 seats on the countywide transit authority board, as currently proposed.&quot; Since we would be paying the majority of the money, we should have the majority of the seats and votes. I think there is a name for it... Gosh... Hmm... Taxation without representation! Isn't that it? Mon, Jan 23, 2012 : 1:29 p.m. I think the idea behind this is great. I live in Ypsilanti Township off of Whittaker road and think if there were buses that came out there, I might take the bus to work if there were buses that were expedited. I also think it is great for disabled people who have a green card, none of these people can get their cheap taxis if they don't live on the bus line. It will allow people who have disabilities in my area to get cheaper transportation. What I don't agree with is that Ann Arbor residents should have to pay more. Why wouldn't we all just be taxed the same? Mon, Jan 23, 2012 : 1:19 p.m.
Why should Ann Arbor taxpayers support a countywide bus system? What's in it for us? Mon, Jan 23, 2012 : 10:18 p.m.
Because it will help people who can't afford to live here to work at businesses located here. At jobs more than a few city residents don't or wont do. Mon, Jan 23, 2012 : 8:21 p.m.
Mon, Jan 23, 2012 : 7:51 p.m.
Because so will the entire county pay taxes, so you will gain another 200k taxpayers.